SDXC cards are flash memory cards and are optimized for digital camcorders and digital cameras that offer less than 4K video quality. SDXC cards are a higher-capacity version of the SDHC card, which is a higher-capacity version of the original SD card. SDXC cards hold at least 64 GB of files and may hold up to 2 TB. By contrast, SDHC cards store up to 32 GB of data, and the SD card handles up to 2 GB. For camcorder owners, SDXC cards store many more hours of high-definition video footage than SDHC cards. In addition to offering higher capacities, SDXC cards are also capable of faster data transfer speeds, with a maximum speed of 300 megabytes per second (MB/s). In contrast, SDHC cards achieve up to 10 MB/s. These cards are grouped into four classes: Class 2, Class 4, Class 6, and Class 10. Class 2 cards offer a minimum sustained data rate of 2 MB/s, Class 4 of 4 MB/s, Class 6 of 6 MB/s, and Class 10 of 10 MB/s. Depending on which manufacturer made the card, the speed class is prominently displayed or buried in the specs. Either way, keep an eye out for it. For standard-definition camcorders, an SD or SDHC card with a Class 2 speed is all that is needed. It’s fast enough to record the highest quality standard definition video available with these camcorders. Cards with a Class 4 or Class 6 speed rating are fast enough to handle the data transfer rates of high-end high definition camcorders. While you may be tempted to spring for a Class 10 card, you'll be paying for performance you don't need in a digital camcorder. In many cases, SDXC cards offer faster speeds than you need for a digital camcorder. 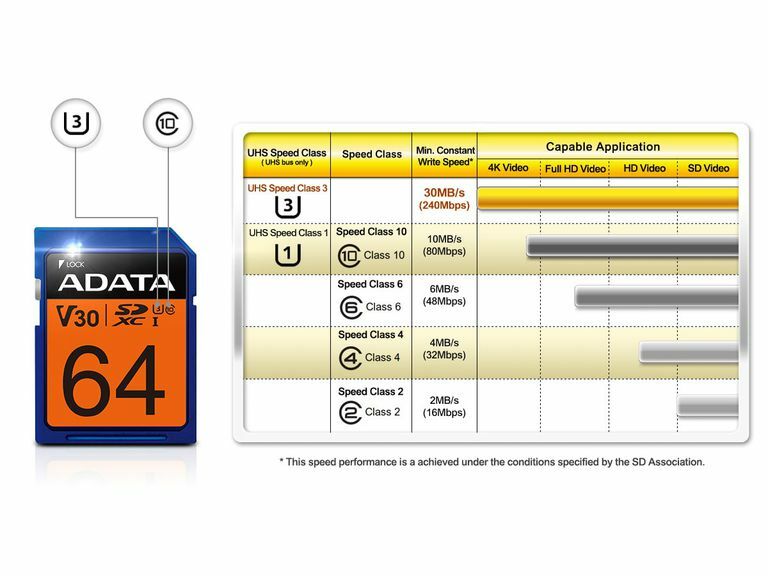 These faster speeds offered by SDXC cards are useful for digital cameras — it supports ultra-fast burst modes — but they're not necessary for digital camcorders. SDXC cards began to filter onto the market in late 2010 and early 2011. As with any new memory format offering high capacities and faster speeds, early products cost more than the lower capacity and slower SDHC cards. However, as more flash memory card makers offered SDXC cards, the costs dropped sharply over the next two years. An SDXC card may work in an older device that doesn't specifically support it, but it won't have the larger capacity or faster speed it is capable of providing. Most cameras and camcorders introduced in 2011 support SDXC. Support is more limited in cameras and camcorders introduced in 2010. If a camera takes an SDXC card, it will also work with SDHC and SD cards. Do You Need an SDXC Card? If your device supports it, buying an SDXC card makes the most sense. In the last few years, the technology underlying flash memory cards changed. A different bus (a method of interfacing with the hardware) allowed for a new class of cards with a write speed of up to 30 MB/s. This type of card is optimized for 4K video.